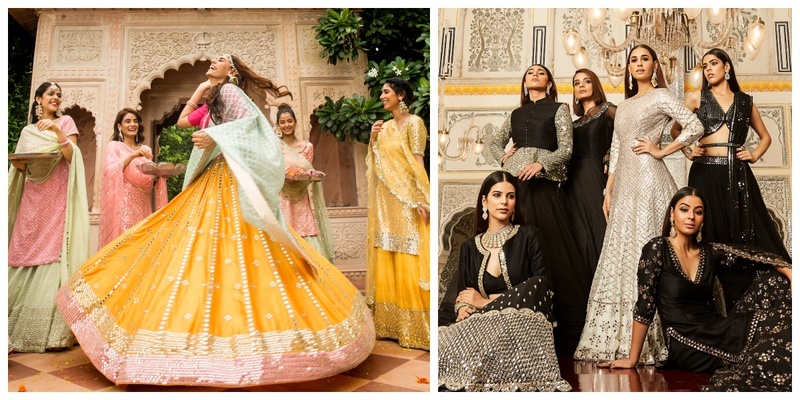 Abhinav Mishra's latest collection is all a bride needs for a royal wedding! Abhinav Mishra launched his latest collection - ‘An Untold Story’ and I am in LOVE with it! It’s his first ever complete Bridal collection and it’s said to be a visual interpretation of the wedding of his dreams. The collection unfolds in four layers - the festive Mehendi, the romantic Cocktail, the spectacular wedding and the glorious Reception. Meaning a look for every function! This collection consists of bright and fun lehengas and shararas strewn with mirror-work splashed in bright hues to brighten the mehendi function. The cocktail collection is a stunning amalgamation of the signature Abhinav Mishra mirror-work featuring contemporary silhouettes with a darker palette including indo-western jackets, lehengas, shararas, voluminous skirts with peplum tops and more. The wedding collection features classic cuts across a range of stunning lehengas. A stunning selection of lehengas designed for the grand reception come in a motley of colours. The designer says, “An Untold Story - is the coming together of my vision to modernize Indian craftsmanship fused with my imagination and my childhood memories, stories I’ve never told. Designing for the young Indian woman who is a unique amalgamation of the dynamic contemporary world and her Indian heritage. It is with my memories that I approached that this collection, I remembered details like clinking glass bangles, giggling girlfriends teasing the bride, the soft, happy tears of a mother that she gently wiped off on a glittering, goldwork pallu. With this collection, I want an Abhinav Mishra bride to relive moments like those, with me”.